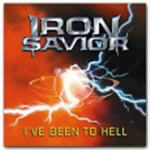 Iron Savior - 2000 - I've Been To Hell EP - Música en Taringa! Download -> Ver en los comentarios. Power metal -- a forceful, hard-driving,and aggressive yet melodic style of heavy metal associated with headbangers like Iron Maiden, Judas Priest, Queensrÿche, Helloween, and King Diamond -- got started in the '70s and reached its commercial peak in the '80s - But after the '80s -- after Nirvana and Pearl Jam radically reshaped rock music in general -- power metal (which is closely related to fantasy metal) was considered old-school and wasn't nearly as plentiful; the dominant metal style of the '90s and 2000s has been alternative metal (a broad, far-reaching term that has been applied to everyone from Hammerlock to Rage Against the Machine to Sevendust) - Nonetheless, some new power metal bands surfaced in the '90s, and their melodic yet aggressive approach was a throwback to the '70s and '80s - Like Sweden's Evergrey, Argentina's Jezabel, Italy's Rhapsody, and New Jersey's Symphony X, Germany's Iron Savior is a '90s/2000s band that is untouched by post-'80s alt metal; unapologetically retro, Iron Savior is mindful of Priest, Maiden, Queensrÿche, Helloween, and other bands from power metal's heyday - Everything about Iron Savior is retro in a '70s/'80s-like fashion; from their appearance to their guitar riffs to their larger-than-life, fantasy-band lyrics, Iron Savior takes listeners back to a time when Saxon, Grim Reaper, Savatage, and King Diamond reigned supreme. Iron Savior was formed in Germany in 1996 by veteran headbanger Piet Sielck, a multi-faceted singer, guitarist, producer, engineer, and keyboardist who had been in a very early lineup of Helloween back in the early '80s - It was in 1996 that Sielck (who has no problem singing and writing in English despite growing up in a country where German is the primary language) recruited singer/guitarist Kai Hansen (of Helloween and Gamma Ray fame) and drummer Thomen Stauch (who had been with Blind Guardian) - Along the way, Iron Savior has had its share of lineup changes - Both Hansen and Stauch have since left the band; another ex-member is drummer Dan Zimmerman (who has also been with Gamma Ray and Freedom Call) - Reportedly, Hansen left Iron Savior on friendly terms with Sielck; after deciding that trying to split his time between Iron Savior and Gamma Ray was way too demanding, he opted to simplify his life and concentrate on Gamma Ray exclusively - In 2002, Iron Savior's five-person lineup included Sielck (lead vocals, guitar), Joachim Küstner (guitar, background vocals), Jan Soren Eckert (bass, background vocals), Andreas Kuck (keyboards, background vocals), and Thomas Nack (drums, percussion) - Iron Savior's self-titled debut album was released in 1997; it was followed by Unification in 1998, Interlude in 1999, Dark Assault in 2001, and Condition Red in 2002. Anyway, just like after the first (or before the second, that's up to you) album, the Hamburg-boys are offering a mini-album, with four tracks, two of them fresh and two cover-tunes - The new IRON SAVIOR-stuff "I've Been To Hell" and "Never Say Die" feature the already traditional IRON SAVIOR-style: powerful, fast, with Piet Sielck's characteristic voice, I'm already looking forward to the next album! The two cover-versions are good ones, too, JUDAS PRIEST's "The Hellion - Electric Eye" and KROKUS' "Headhunter" (where bassist Jan-S - Eckert has taken over a good part of the vocals), while I like the double-bass-driven interpretation of the Swiss song a good bit better, but die-hard PRIEST-fans might think differently, of course. Just as usual it is fairly difficult to rate a four-tracker, because it is more an appetiser and you also could debate about the sense and nonsense of such releases, but as long as the quality is right, like here, I see no reason to generally pass judgement about them.